NOTE: This has nothing to do with IOU or the guild anymore. It has become too immense for me to expect people to want to participate on a spreadsheet (If you still want to, you can ask me, but it will be on an external document seperate from the Guild Encylopedia.) I will make a simplified version that just uses the character and put a single horizontal row of all of the guilds characters on a sheet on the spreadsheet, maybe the bottom of the memberlist. I'll update the row of members gear every few days as our guild's members get stronger. Greek Gods Encyclopedia Guild Character Sheet Mini-Game! Closed Alpha Release. Still testing everything. Post in this thread and ask if you want to help with testing. Will change this text in future. Feel free to suggest any changes/additions/removals that you'd like. I'd love to shape the game to the participants preferences. The best place to do this would be this thread. - Something to use your equipment for! Monsters to fight? Dungeons to explore? GGEGCSMG levels to gain? I have no idea. - More achievements in future and arena achievements will change to from 25/30 to 30/40/50 when new stages are released by Ray. Things will be really ugly in there, that's why it's closed. The name is a joke and a filler, if a cool name's suggested I'll change it to that. - Alpha Prototype of World Map, First Two Zone Maps, Combat System, Experience and Levelling system and Statistics Distribution. - Beta Release, estimated Public Release of Spreadsheet. - Start creating HTML/Java port of game. - Finalize Alpha Prototype of Combat System. 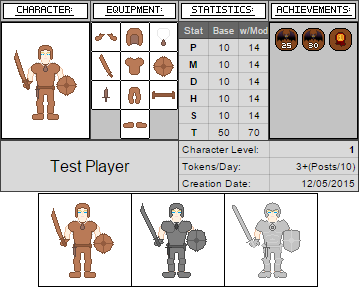 - Start creating statistics, experience and levelling systems. - Finalize Alpha Prototype of Zone Maps. - Start creating Alpha Prototype of Combat Engine. - Finalize Alpha Prototype of World Map. - Start creating zone maps. - All sheets relating to GGEGCSMG removed from Guild Encyclopedia. - Character sheet remade and extended. --- Combined equipment icons into one image joined with the character display. - Started creating world map. - Investigating options from porting out of a spreadsheet. - Epic amounts of theory crafting done, heaps of cool ideas that seem implementable. - Will probably leave a single sheet that has a few Character Sheets as a preview with a link to the other document on a Sheet of the Guild Encyclopedia, if everybody is okay with that. - A bunch of formatting changes. - Prototype Alpha Template created. Yeah sorry about that, kinda stalled development cause of the christmas season, I have half completed the next two sets (Steel/Carbonite) and shouldn't need much more to to release the playable version. Also people seem quite willing to fill out the extra cells on the member list, so I'm pretty sure even if players don't play I will generate a character with gear for every manner and make a ~40-60px high horizontal banner of all of the guild members that goes across the top of the Member List. I'll remove it if people think it gets in the way or whatever.